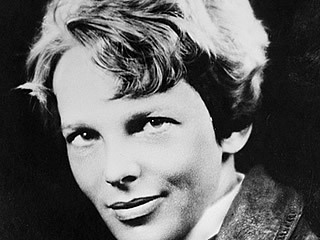 Amelia Earhart was born on July 24, 1898 in Atchison, Kansas. Her father was a lawyer and her mother the daughter of a wealthy judge. 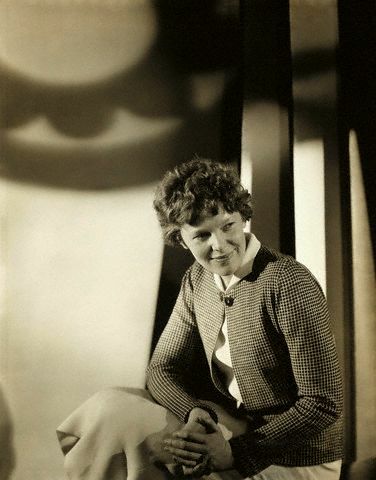 Her parent's difficult marriage had a profound effect on Amelia Earhart's philosophy of life. Her father, Edwin, was frustrated because he was never able to provide his wife with the kind of lifestyle she had become accustomed to growing up in the judge's house. He gave up his dreams and instead worked as an attorney for the railroad because the position paid the most. Even with this good salary, there were money pressures on Edwin and he began to drink. This lead to an alcohol addiction and the loss of his job. Edwin moved his family to Des Moines, Iowa, then to St. Paul, Minnesota. His alcoholism continued, though, and he found it difficult to find and keep a job. Finally his wife, Amy, took the children, Amelia and her younger sister, Muriel, to live with friends in Chicago while Edwin went to Kansas City to make a new start. Amelia saw her father's frustration and unhappiness and determined that she would be an independent woman who could share responsibilities equally with a man and not be dependent on him. She graduated from Chicago's Hyde Park High School on time in 1916 despite the numerous different schools she'd been moved through. She assisted in a Toronto military hospital during World War I and afterward enrolled in the medical program at Columbia University in New York City in 1919. She did well there, getting A's in Zoology and French and B's in Chemistry and Psychology. One of her professors said, "She had a great curiosity and fine ability to synthesize...who knows what she would have discovered if she had chosen the research laboratory rather than aviation as a career?" It was not to be, though. Her father was able to open a law office in California and Amelia and her mother moved back in with him. While there, Amelia attended an air show and her father arranged for her to take a trial flight. In the air, Amelia realized she'd found her calling. She immediately arranged to take lessons on an installment plan from Neta Snook, the first woman graduate of the Curtiss School of Aviation. Later she took additional training from John Montijo, a former Army instructor. In June 1921 Amelia Earhart took her first solo flight. 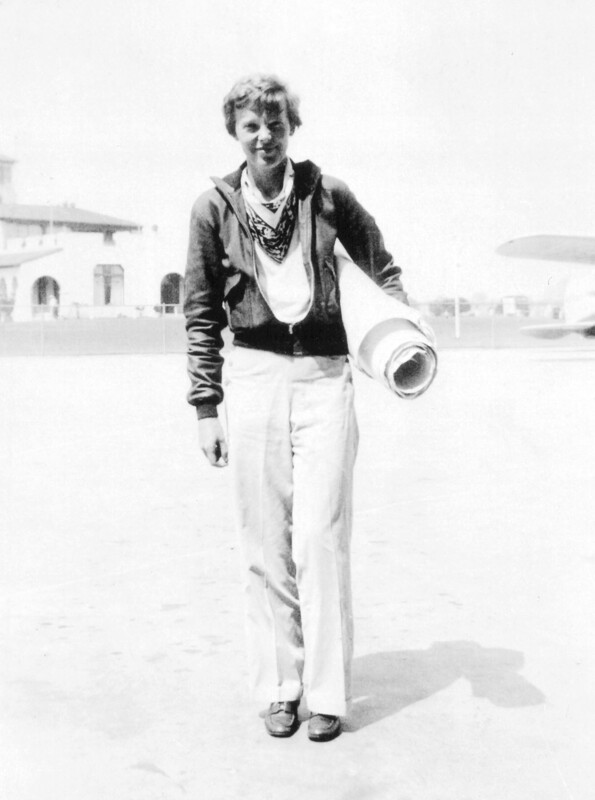 Earhart soon became a fixture around the airfield in her leather flying jacket, khaki pants, boots and scarf. Her skill increased with her hours in the air and she won grudging respect among the male flyers. In 1922, with the help of her father, she purchased a sport biplane built by William Kenner. 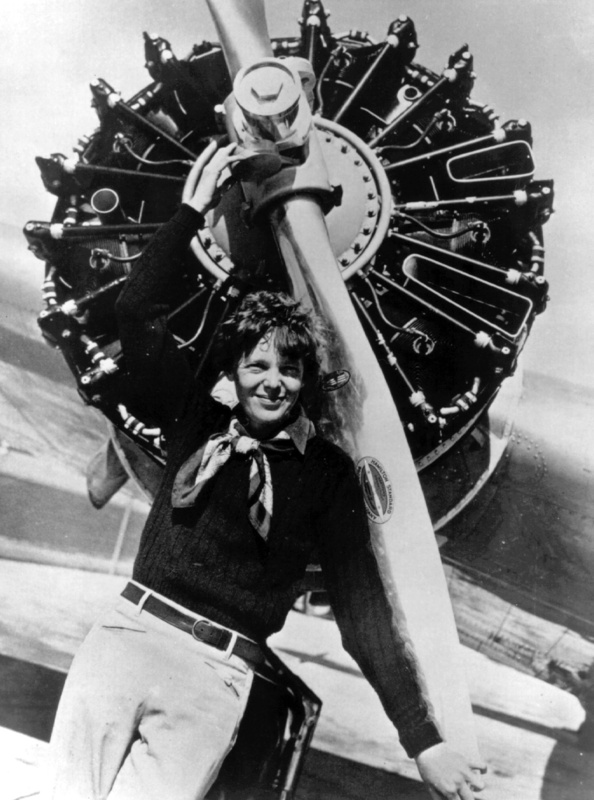 That same year she used her plane to set her first aviation record which was the maximum-altitude-obtained-by-a-woman-pilot: 14,000 feet. While things were going well for Earhart in the air, her family was having problems back on the ground. Her parents divorced in 1924. Amelia decided to put her aviation on hold, sold her plane and bought a car. 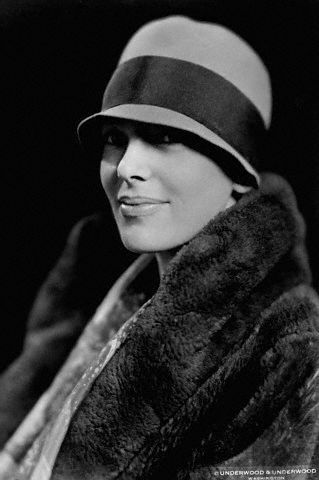 She used the car to drive her mother across country to settle in Medfort, Massachusetts where Amelia's sister, Muriel lived. Amelia returned to her studies at Columbia University, but withdrew before the semester was over. 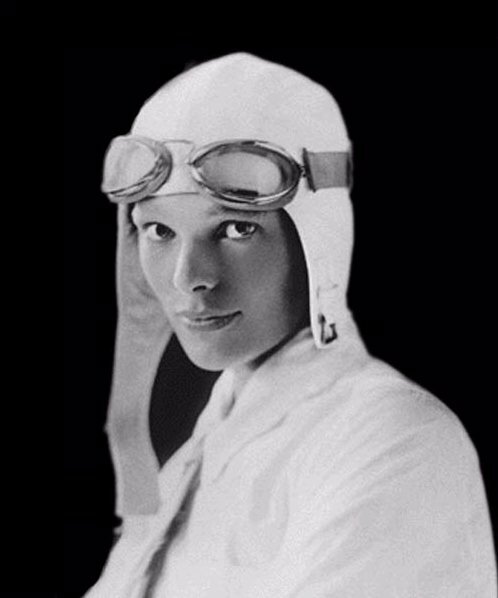 Earhart later told friends, "That semester convinced me that I didn't have the qualities to be an M.D. For one, I lacked the patience. I wanted to be doing something, not preparing for it." In 1926 she accepted a position as a social worker at a settlement house in Boston. She might have made a career in social work if it hadn't been for a phone call two years later from a man named George Palmer Putnam. In 1919 a U.S. Naval flying boat had crossed the Atlantic to Portugal via the Azores Islands. In 1927 Colonel Charles A. Lindbergh made the first solo flight from New York to Paris. The world was going wild for aviation and Mrs. Frederick Guest of London decided that it was time for a woman to make the cross-Atlantic flight. Mrs. Guest, who was wealthy, purchased a tri-motor Forkker aircraft and planned to hire a crew to take her on the flight. After reassessing the dangers involved, Mrs. Guest decided to back out and allow another girl "with the right image" to take her place. George Putnam, from the publishing company G.P. Putnam's Sons, who hoped to publish an account of the trip, started searching for a replacement. He hoped to find a girl with a flier's license and an extraordinary amount of courage. He found Amelia Earhart. 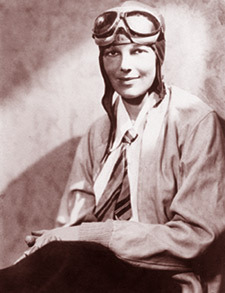 Putnam proposed the project to Earhart. She would have liked to have been more that just a passenger on the flight, but realized it would still be a great adventure. Wilmer L. Stultz was selected as the pilot. The Forkker was flown to Trepassey Bay, Newfoundland and there the crew of three waited for good weather. On June 17th, 1928 it cleared and the Forkker, which had been christened Friendship, took off. It landed in Burry Port, Wales with less than an hour of fuel still on board. 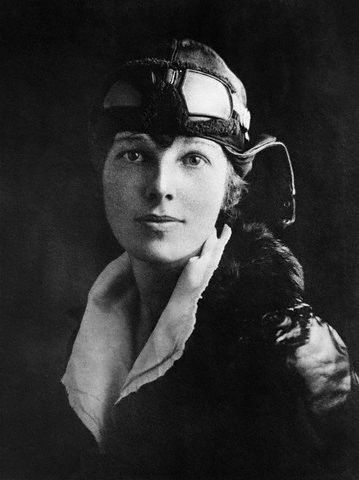 The flight brought instant fame to Earhart including a ticker-tape parade through New York City. 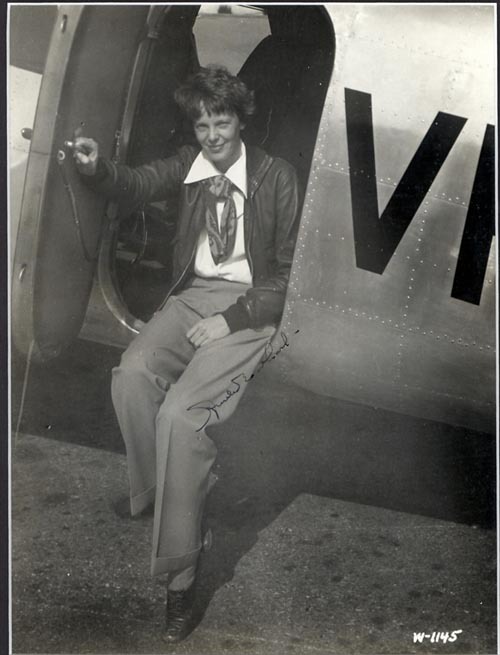 George Putnam assisted Earhart with her account of the flight published as 20 Hrs., 40 Mins.. After the book was done, she set out on a lecture tour and later took a position as Aviation Editor on Cosmopolitan magazine. 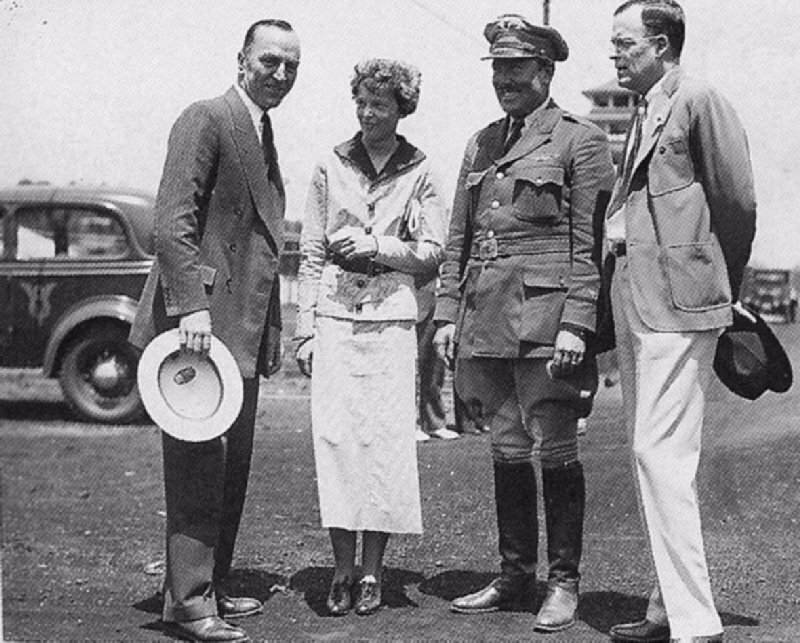 After Putnam's divorce in 1930 he went on a campaign to win Earhart as his wife. He proposed several times before she finally accepted. They were married on February 7th, 1931. George probably wasn't the perfect mate for Earhart but he did provide her a business manager and media spokesman all rolled into one. 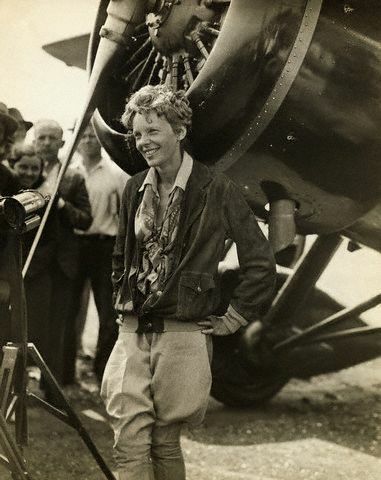 Most importantly, from Earhart's point of view, Putnam never tried to curtail her freedom to fly. 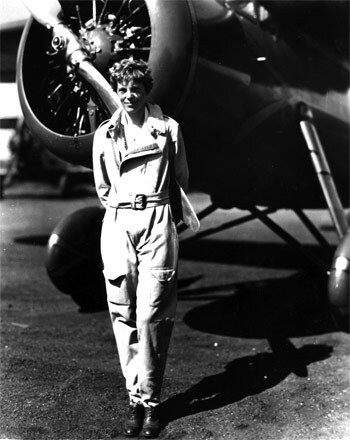 George arranged for Earhart to promote everything from cigarettes (though she didn't smoke) to pajamas to luggage. She did put the brakes on some of Putnam's plans. When he wanted to sell a small ribbon meant for children and decorated with her signature Earhart told him, "Forget it, George. I won't be a part of cheating youngsters. Adults are supposed to know better, but not kids." 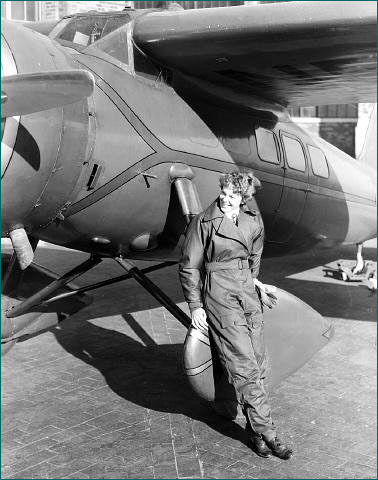 Earhart felt guilty about her fame because she'd only been a passenger on the transatlantic flight, not the pilot. 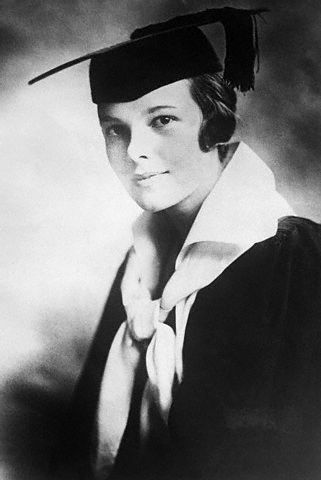 To remedy this on May 20, 1932, exactly five years after Lindbergh, she soloed from Newfoundland to Ireland and became the first woman to fly the Atlantic alone. This earned her audiences with princes, kings and presidents. 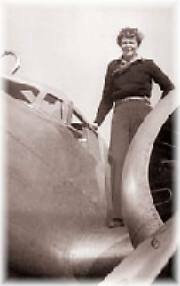 She became the first woman to be honored with the Distinguished Flying Cross. 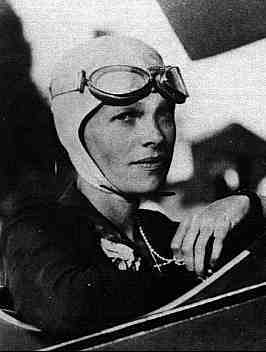 Three months later she broke the woman's non-stop transcontinental speed record by flying from Los Angeles, California to Newark, New Jersey, a distance of 2448 miles in 19 hours and five minutes. 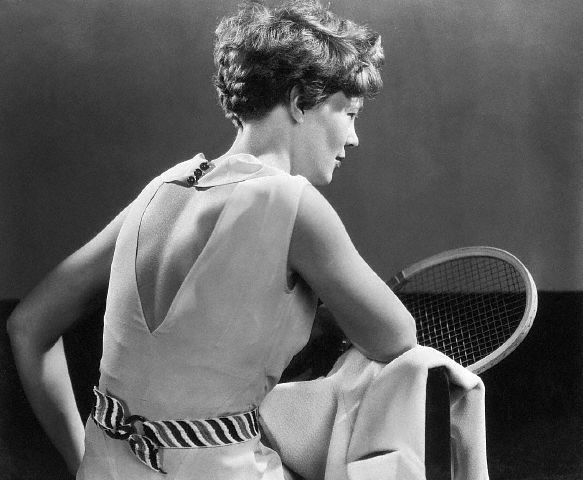 In 1933 she broke the record again by repeating the trip in 17 hours, 7 minutes and 30 seconds. 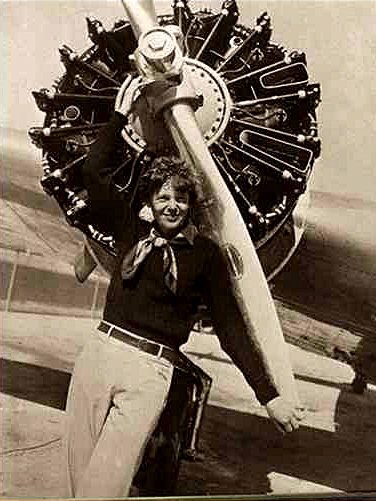 In 1935 she became the first pilot, man or woman, to solo from Hawaii to California. Three months later she became the first to solo from Los Angeles to Mexico City. Then three weeks later she again soloed from Mexico City to Newark, New Jersey. 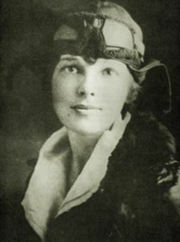 Earhart was invited to join Purdue University as a visiting counselor for women students. She loved her role there and the University decided to establish a special fund for aeronautical research. Fifty-thousand dollars was given to Earhart to outfit what she called her "Flying Laboratory": a Lockheed Electra twin-engined airliner. She had the seats removed and extra fuel tanks put in their place. With these changes the plane had a fuel capacity of 1204 gallons which gave it a range of 4,500 miles. With this new plane Amelia decided it was time to go for one of aviation's most difficult challenges: a flight around the world. A team was quickly put together to support Earhart on her flight. Paul Mantz, an experienced pilot, was hired as technical adviser. 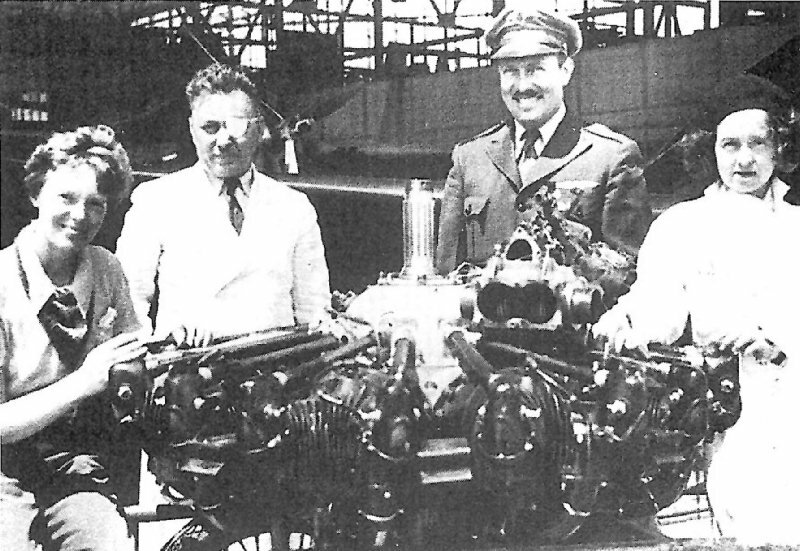 Captain Harry Manning and Commander Fred J. Noonan were selected as navigators. Clarence Williams prepared the maps and charts for the flight. It was decided to fly from east to west, so on March 17th, 1937, the Electra took off from Oakland, California heading for Hawaii. The first leg of the trip went flawlessly and the plane arrived in Honolulu fifteen hours and fifty-two minutes later. The plane refueled and on March 20th it taxied out onto the runway to make the long trip to tiny Howland Island where the U.S. Navy had recently constructed a emergency landing strip. 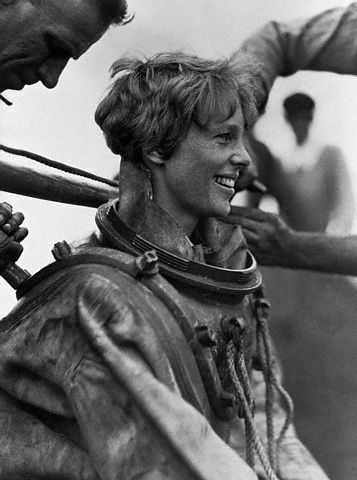 The plane, heavily loaded with fuel, responded sluggishly when Earhart applied the throttle. The plane lurched to the left then swung right. Earhart tried to compensate, but couldn't. The Electra groundlooped, the gear collapsed and a wing was torn open. Fortunately, though fuel poured from ruptured tanks across the ground, there was no fire. Manning, Noonan and Earhart suffered no injuries, but the Electra had to be sent back to Lockheed's facility in Burbank for repairs. It was never clear exactly why the accident happened. 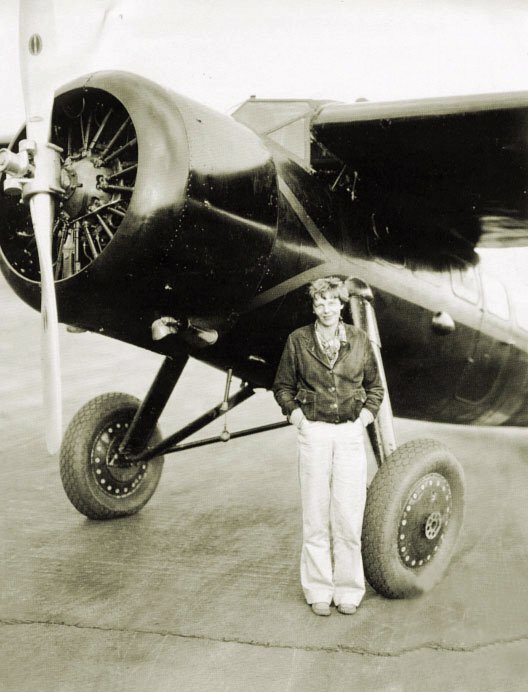 Some blamed a blown tire, while Earhart herself believed that the fuel had not been distributed evenly throughout all the tanks causing a weight imbalance. It took less than two months to repair the plane and a new attempt was scheduled to start on May 20th. 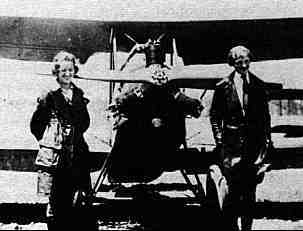 Because of the delay, Captain Manning was unable to continue on as navigator and only Noonan flew with Earhart. Seasonal weather conditions prompted them to change the flight to go west to east. The first stop for the Electra (after leaving Oakland) was Tucson Arizona. On June 1st Earhart left U.S. airspace at Miami, Florida on her way to Puerto Rico. The flight went without major incident for over a month. The plane had small repairs done to it along with several routine engine overhauls as needed. By July 1st they had reached Lae, New Guinea. About seven thousand miles remained to be covered. Most of it was over the wide, empty expanse of the Pacific Ocean. The first leg would take them to Howland Island, a distance of 2556 miles. The plane was loaded almost to capacity with gas. Because Earhart didn't want to dilute her tank of high octane fuel used only on takeoff with the low octane fuel available at Lae, the Electra left 50 gallons short of its 1151 gallon capacity. The Electra roared down Lae's 3,000 foot runway at 10:30 a.m., July 2nd. The U.S. Coast Guard Cutter Itasca was stationed off of Howland ready to assist by sending a homing signal to Earhart to guide her in. The plane flew overnight and should have approached Howland and the Itasca the next morning, which because the plane was crossing the international dateline, was July 1st.. Picking tiny Howland Island out of the vast Pacific was a difficult navigational problem. To solve it, Noonan had several tools. The first was celestial navigation. By sighting two stars 90 degrees apart from each other on the horizon and then measuring their height above the horizon, Noonan could use a set of prepared tables and a clock to figure his position. If the sky was overcast, and one of Earhart messages from the plane seemed to imply that, Noonan might not have gotten a two-star fix. If this was the case, he could have directed Earhart to fly by "dead reckoning." This navigational method is simple, but prone to error. Noonan would just figure out where the plane was on the map, then use a compass to calculate the course the aircraft should fly to get to the destination. Because compasses are sometimes inaccurate and the distance was long, the Electra could get many miles off course without the crew noticing. The final method was to home in on the Itasca's radio signal. But, reports from the Electra seemed to indicate it never received a strong enough signal to make that possible. Even if Noonan couldn't get a star fix, when the sun rose he could use a measurement of its height to figure a line-of-position. This calculation would tell the Electra's crew where they were east-to-west, but not north-to-south. They would have to fly north and south along the right line to find Howland Island. This seems to be precisely what happened. At 7:42 A.M. the Itasca picked up the message, "We must be on you, but we cannot see you. Fuel is running low. Been unable to reach you by radio. We are flying at 1,000 feet." The ship tried to reply, but the plane seemed not to hear. At 8:45 Earhart reported, "We are running north and south." That seems to suggest that for at least an hour Earhart and Noonan were flying along that line-of-position searching for Howland. Those were the last words heard from the Electra. By that afternoon it was obvious the plane had either gone into the sea, or landed someplace other than Howland. The U.S. Navy started a massive search. Some 262,281 square miles of the Pacific were examined, but no sign of the Electra or its crew was found. 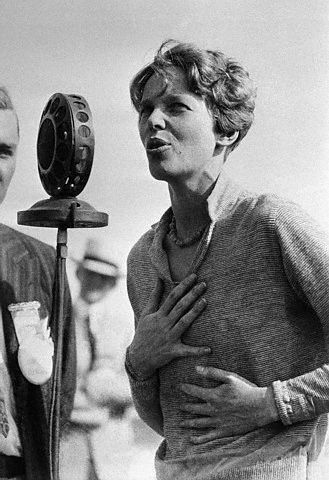 Noonan and Earhart were declared dead, and the great mystery of "What happened to Amelia Earhart" began. In the first few days following the disappearance, there were some 300 reports of messages being received from Earhart's crashed plane. Undoubtedly, most, if not all of them were either hoaxes or misunderstandings. The conflict that would become World War II was brewing in the Pacific and soon after her disappearance it became a popular idea that she had been captured by the Japanese, or that Japanese forces had shot down her plane, or that she was working with the U.S. government on a secret mission against the Japanese. This story was dramatized in a 1943 film, Flight for Freedom starring Rosalind Russell as a Amelia-Earhart-type flyer. 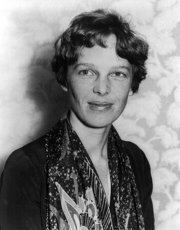 The script followed Earhart's life story precisely, and extended it by suggesting that the disappearance was engineered to allow U.S. Naval forces an excuse to case Japanese military installations. 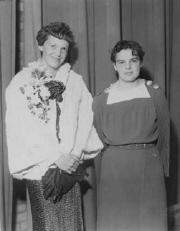 Shortly after the end of the war Jacqueline Cochran, a pilot and friend of Earhart, traveled to Japan to investigate the role of Japanese women in the hostilities. While there she claimed she'd discovered several files on Earhart which later disappeared. Later, in 1965, retired Air Force Major Joseph Gervias came to the conclusion that Cochran had actually discovered Earhart herself and smuggled her back into the U.S.. 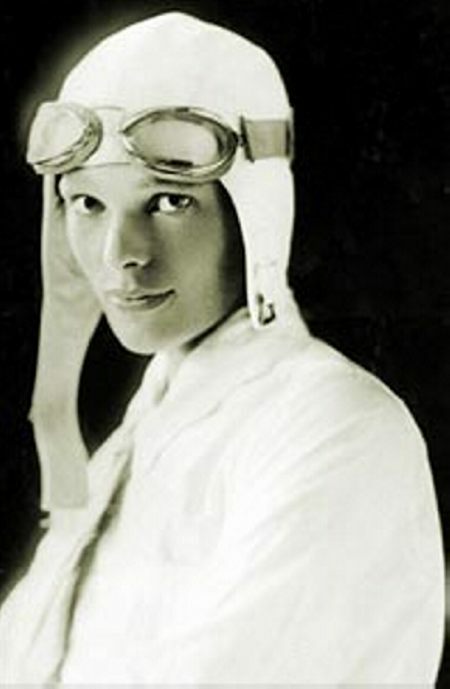 There Earhart set up residence in New Jersey under a new name. 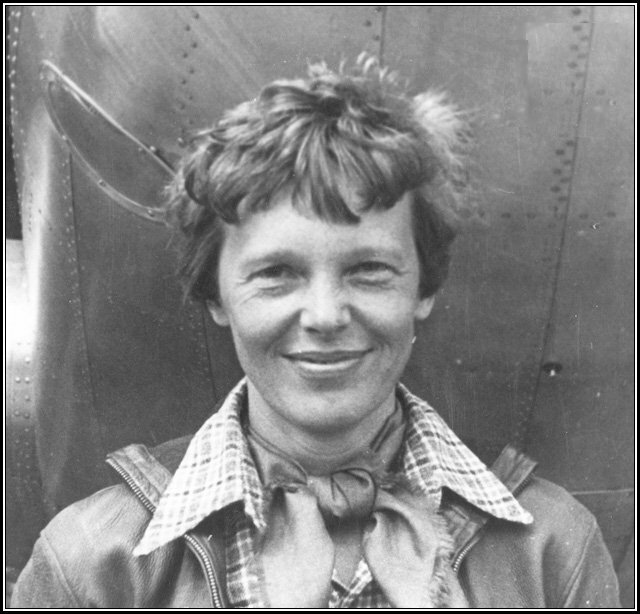 The woman he named as Earhart denied Gervias' assertions. In 1960 a woman named Josephine Akiyama came forward with a tale she said took place while she was living on Saipan (a small Pacific island). In 1937 Akiyama had seen two American flyers there, a man and a woman, who were being held by the Japanese. Saipan seems an unlikely candidate as an emergency landing site for the Electra, though, unless Noonan was very, very lost. Fred Goerner, a CBS broadcaster, took the story seriously and traveled to Siapan, which was at that time under U.S. administration. He found a number of residents who remembered the flyers, though there seemed to be no official record of them. Some reports indicated that the flyers had been executed by the Japanese, something the government of Japan denied. Goerner hired divers to search the bottom of the Siapan harbor and they retrieved what looked like aircraft wreckage. The most interesting piece was what appeared to be an aircraft starter motor and generator. However ,careful analysis by the manufacturer proved it was not the one on board the Electra when it left Oakland. More stories about Siapan emerged including a report from a man stationed on Siapan in 1945. He said he'd been shown graves on Siapan that reportedly belonged to the two mysterious flyers. Another expedition to Siapan recovered the remains of the bodies, but later examination ruled out that they were Earhart or Noonan. Goerner heard other reports that Earhart's plane may have gone down in the Marshall Islands. The Marshall Islands are much closer to Howland than Siapan. U.S. Naval personnel stationed in the area during World War II reported hearing stories from the Islanders that were very similar to those told on Siapan: Two flyers, a man and a woman, crash landed and were taken captive by the Japanese. No proof emerged from these accounts either, though Goerner finally reached the conclusion that Earhart probably crashed in the Marshall Islands and was later held captive on Siapan.